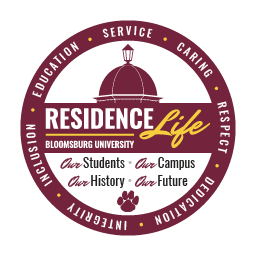 The Office of Residence Life is established to provide an educationally-based residential community which seeks to provide students with personal, shared, and academic experiences; unified by purpose and founded on mutual respect. This community cultivates involvement, enhances critical thinking, develops conflict resolution skills, furthers understanding and appreciation of differences, fosters a sense of identity, and promotes personal and civic responsibility. The emblem you see to the right represents the vision for the work that we do in the residence halls and apartment communities. The words in the outer circle represent the department’s core values: Education, Service, Caring, Respect, Dedication, Integrity, and Inclusion. These words, and the type of effort and energy directed towards our students, encompass the type of philosophical orientation we expect from ourselves and all staff members associated with the Office of Residence Life. The words in the bottom of the circle - Our Students, Our Campus, Our History, and Our Future - reflect the areas that we aim to honor as we carry out our mission of service to others. We are here to serve our students; their success provides the basis upon which we measure all else.